Tonight we will start with a quick review of the first half of this lesson on Improving Your Touches. 2 We are commanded to say Come. 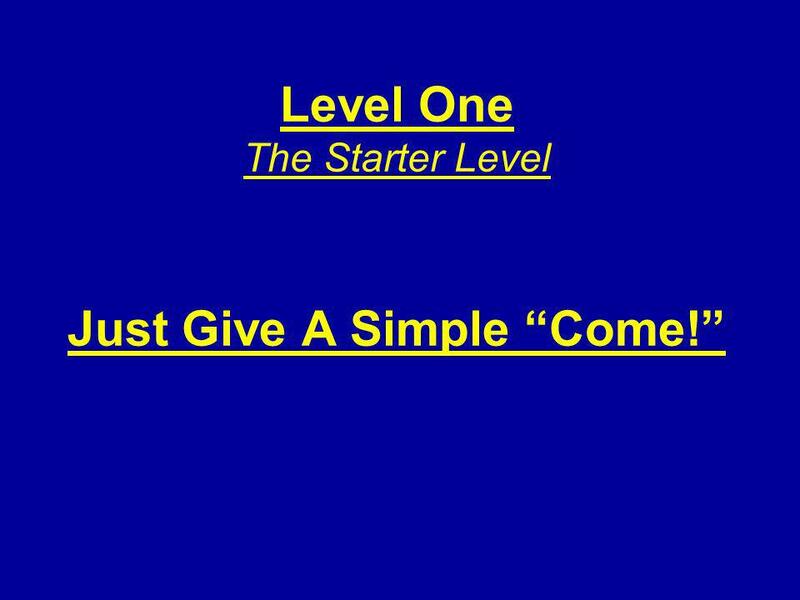 8 Level One The Starter Level Just Give A Simple Come! 9 Just Give A Simple Come! 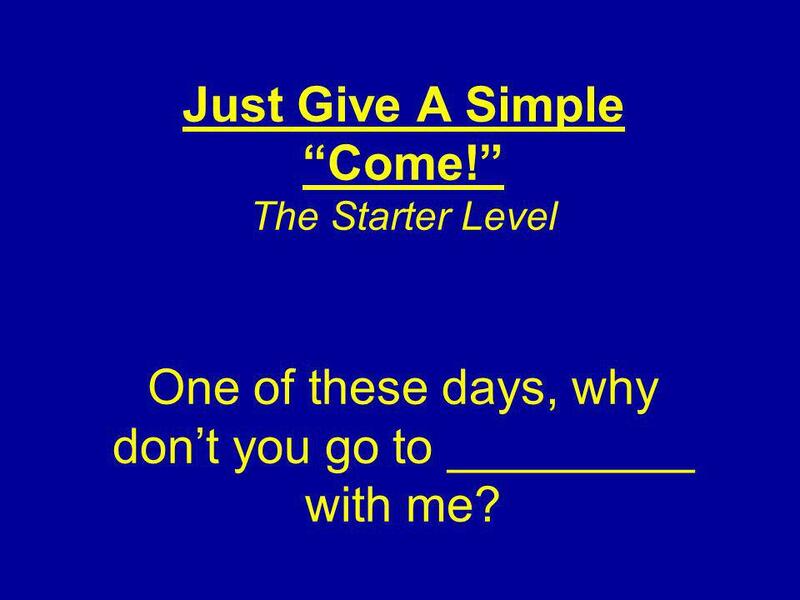 The Starter Level One of these days, why dont you go to _________ with me? 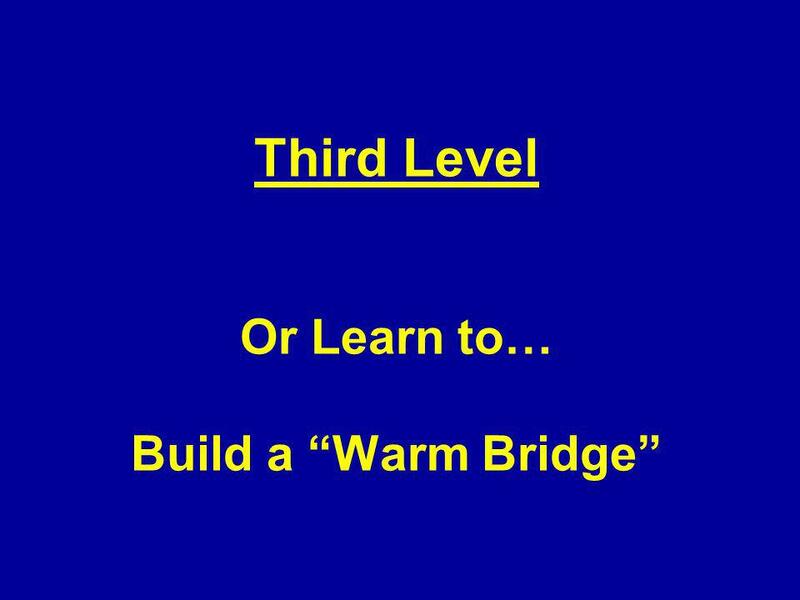 12 Third Level Learn to… Add some warmth and love! 14 I sure like your kids. And I like how hard you are working at being a good mother. You know what would be great for those kids? ______________ ____________________! 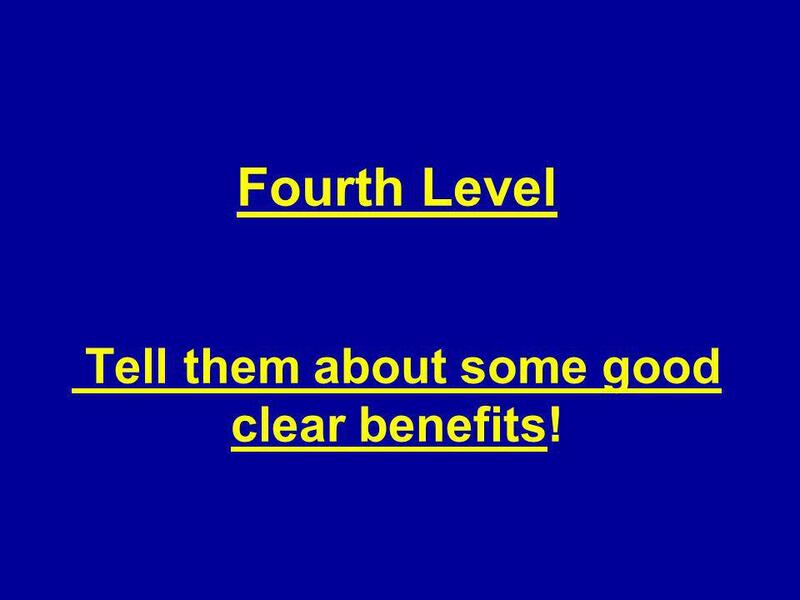 17 Fourth Level Tell them about some good clear benefits! 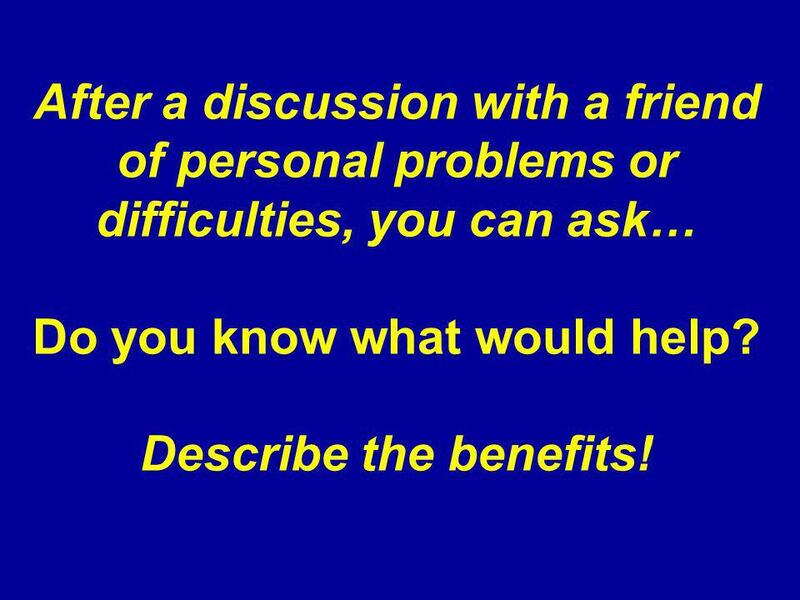 19 After a discussion with a friend of personal problems or difficulties, you can ask… Do you know what would help? Describe the benefits! 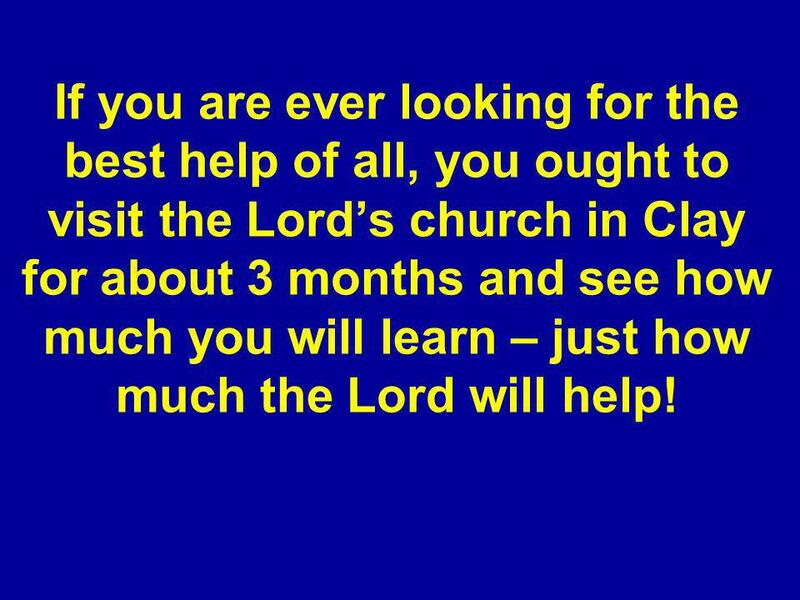 20 If you are ever looking for the best help of all, you ought to visit the Lords church in Clay for about 3 months and see how much you will learn – just how much the Lord will help! 21 I sure like your kids. You are working at being a good mother. 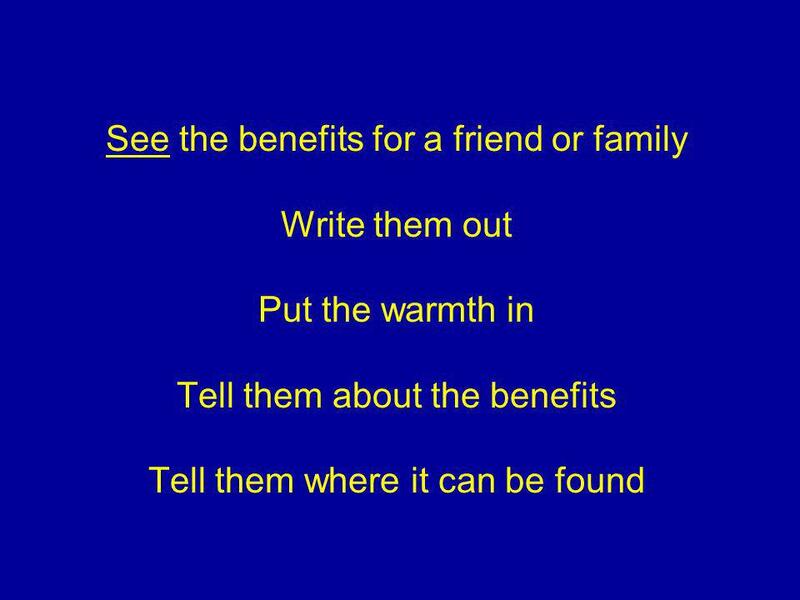 If you are ever looking for a great foundation for them, ___________ ____________. 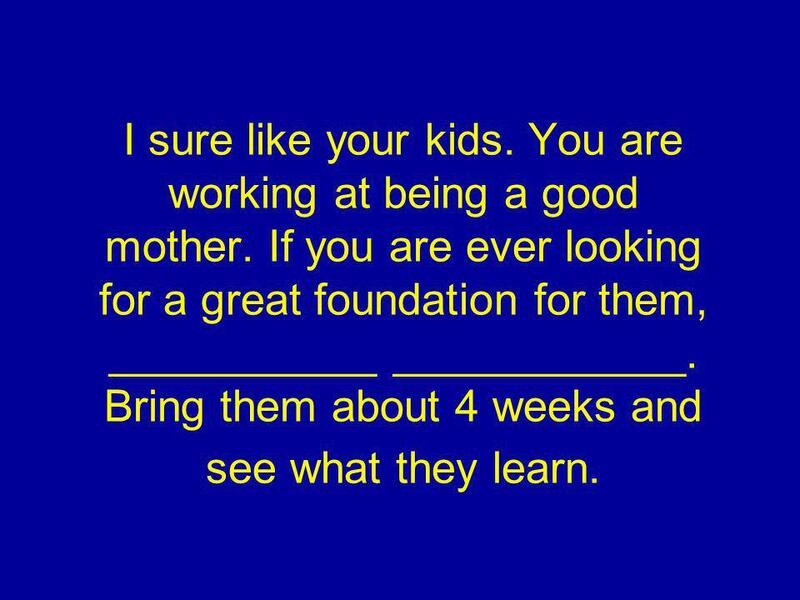 Bring them about 4 weeks and see what they learn. 23 I could say that! 24 Let me stop my list and emphasize an Important point! 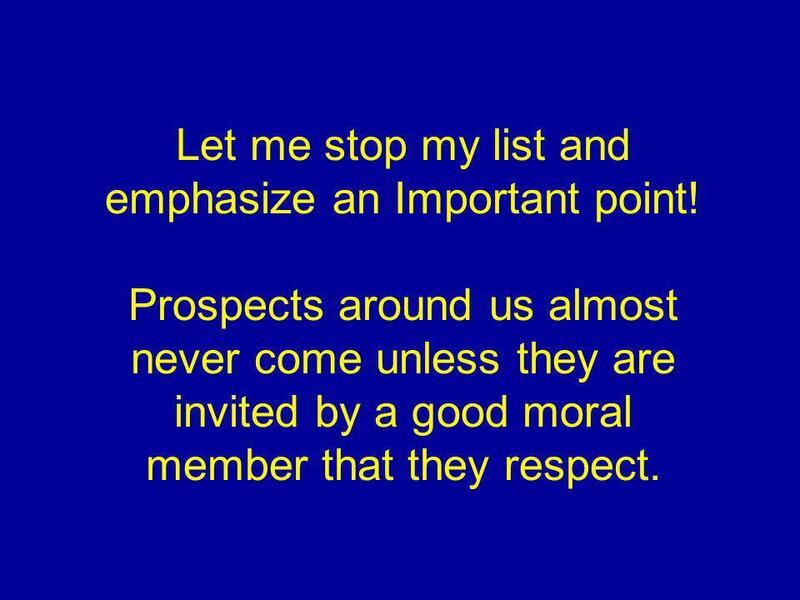 Prospects around us almost never come unless they are invited by a good moral member that they respect. 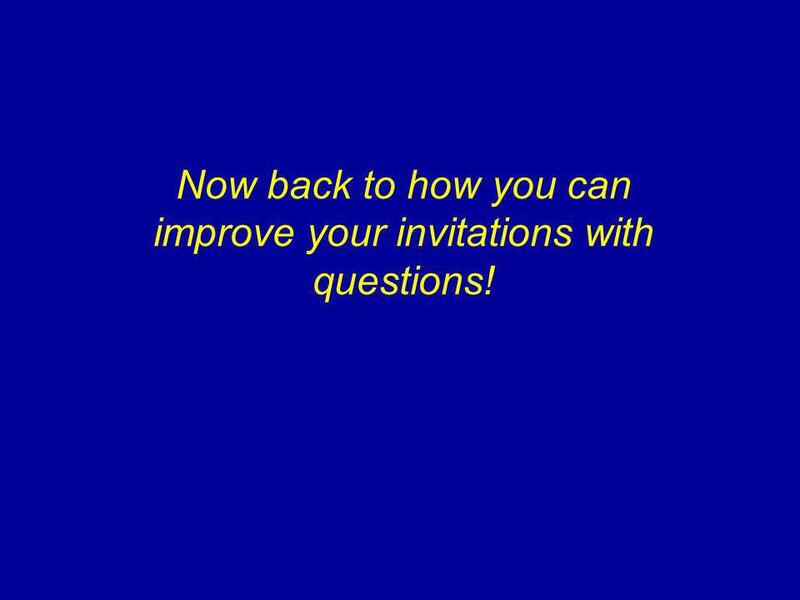 26 Now back to how you can improve your invitations with questions! 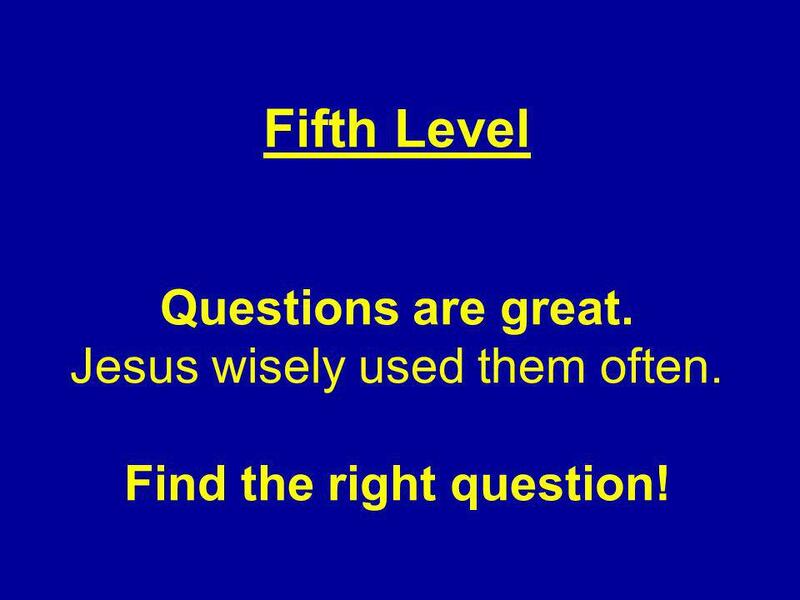 27 Fifth Level Questions are great. 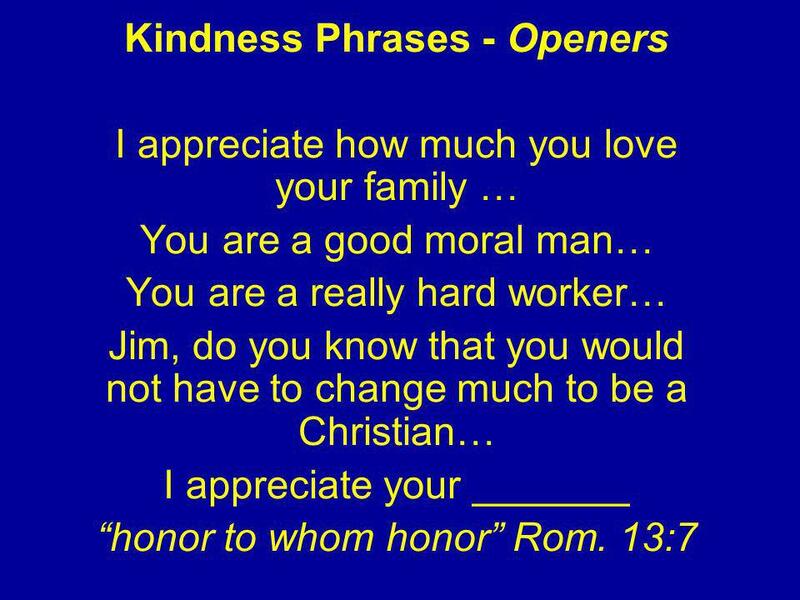 Jesus wisely used them often. 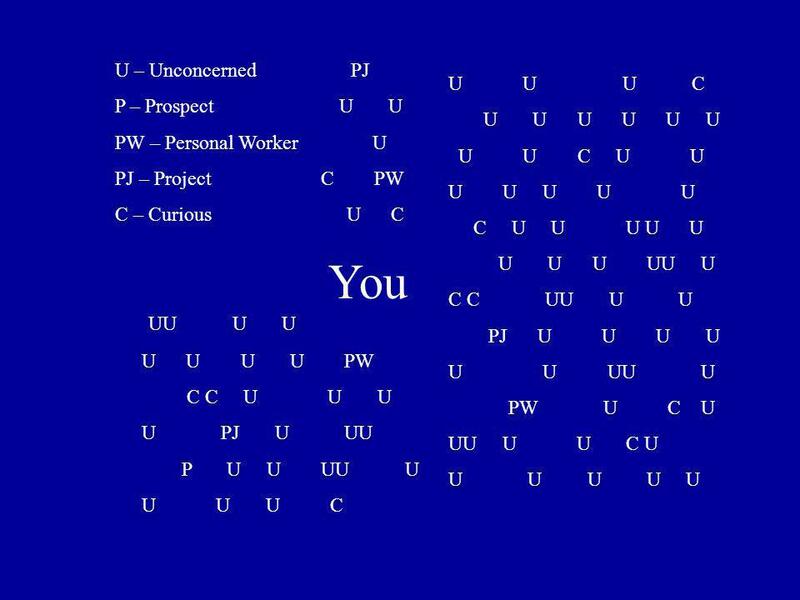 Find the right question! 28 You Can Ask A Mother Bible stories really build childrens morals! 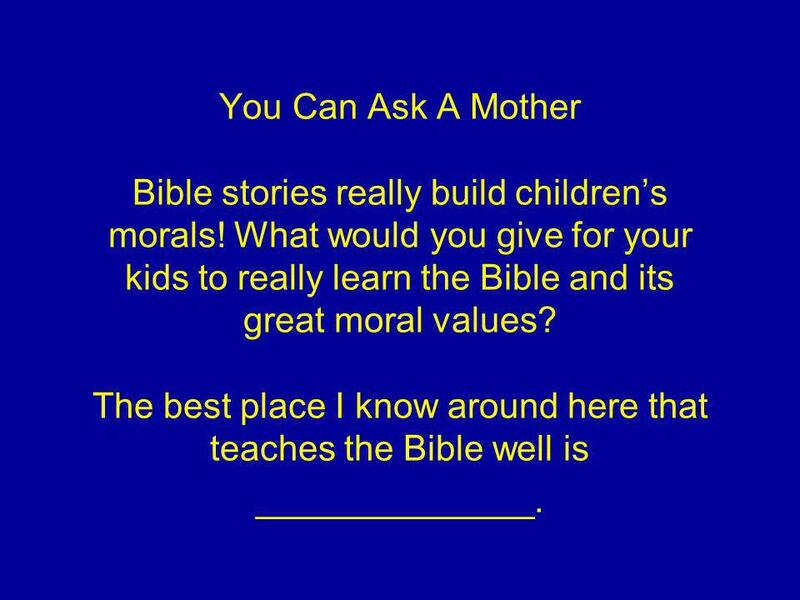 What would you give for your kids to really learn the Bible and its great moral values? The best place I know around here that teaches the Bible well is ______________. 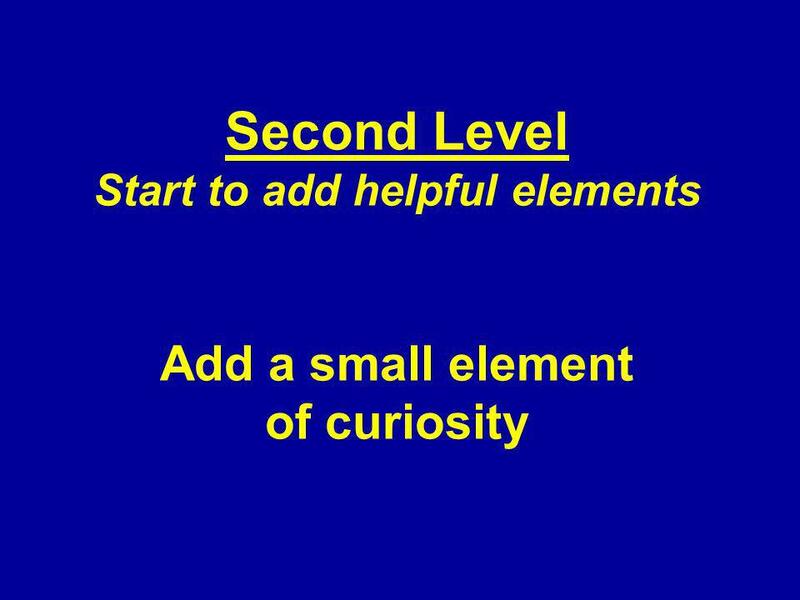 29 You can learn to ask a formative question One that plants a value in their mind! You are doing a great job with your kids. 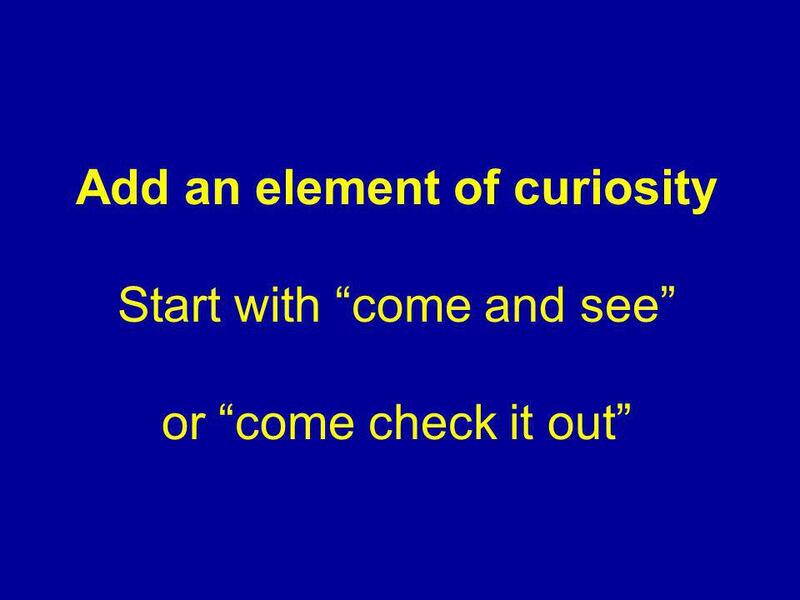 What things are you interested in more for your children – An education for a great job or for them to develop moral strength and character for a good life? 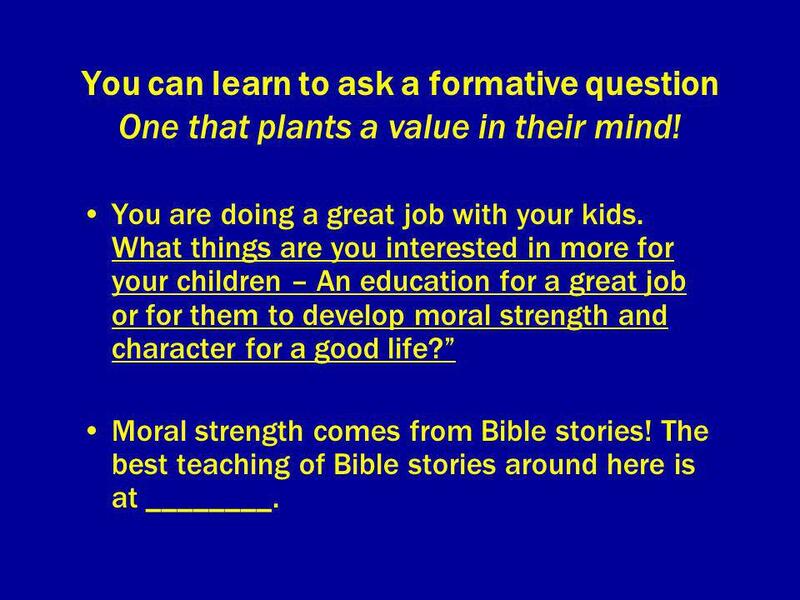 Moral strength comes from Bible stories! The best teaching of Bible stories around here is at ________. 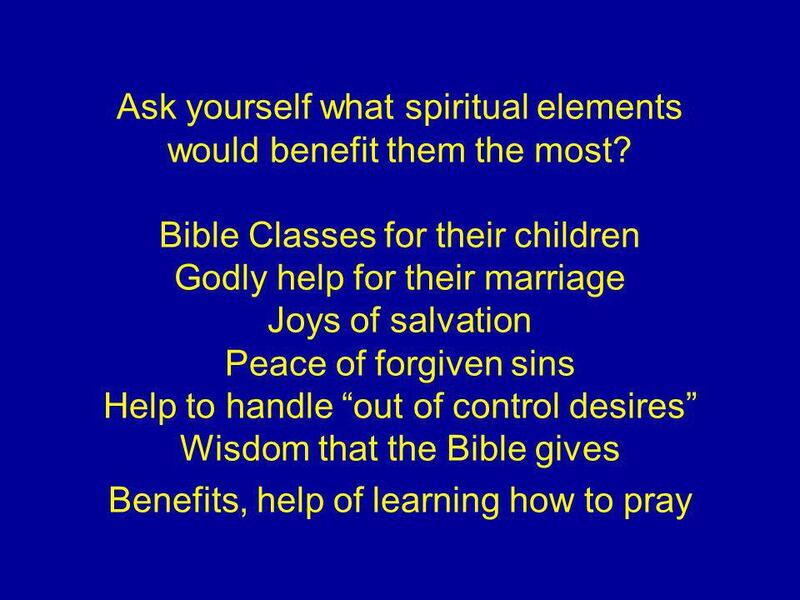 30 You Can Ask A Seeking Person Have you ever thought that you would like to learn more about the Bible? 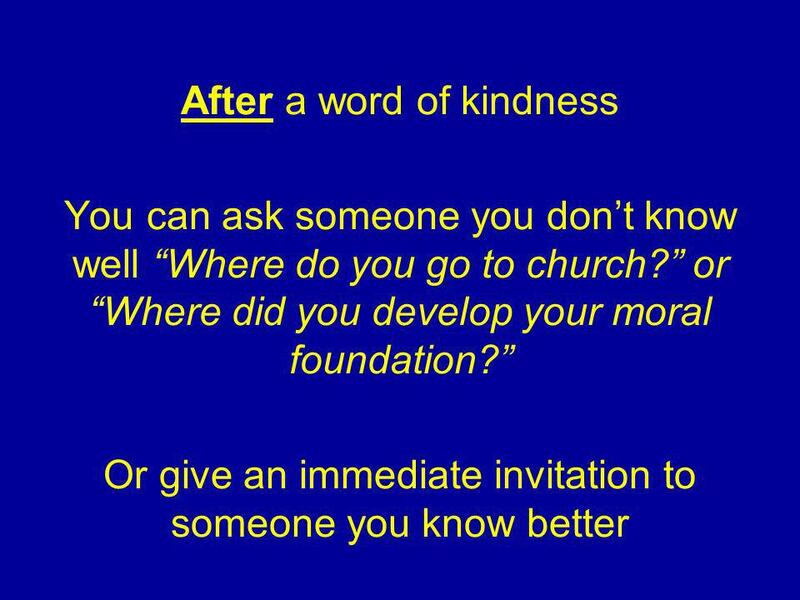 (Reply) If you want to learn the Bible, there is a kind preacher at ________. He really uses the Bible. You could bring your Bible and check him out a few Sundays and see how much you learn. The Bible will really touch you! 31 Asking and Getting A Negative Answer How much would you like to learn more about the Bible? 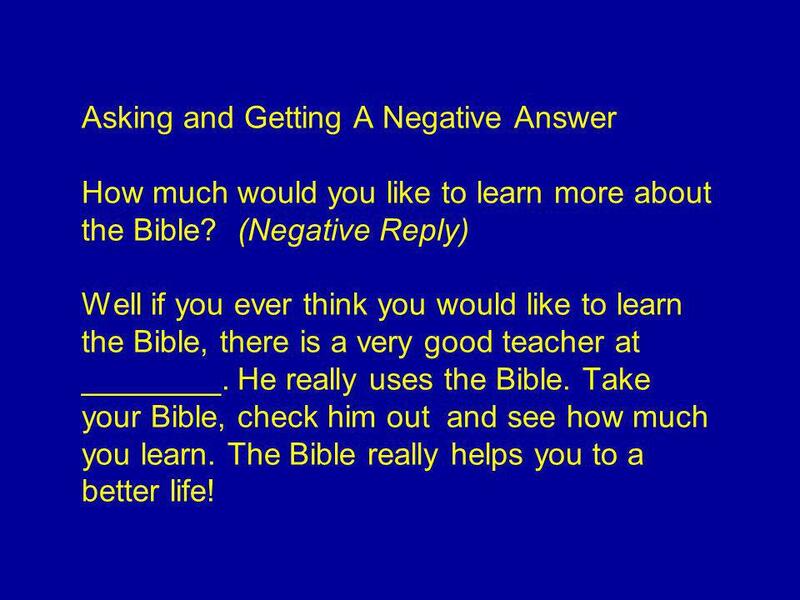 (Negative Reply) Well if you ever think you would like to learn the Bible, there is a very good teacher at ________. He really uses the Bible. Take your Bible, check him out and see how much you learn. The Bible really helps you to a better life! 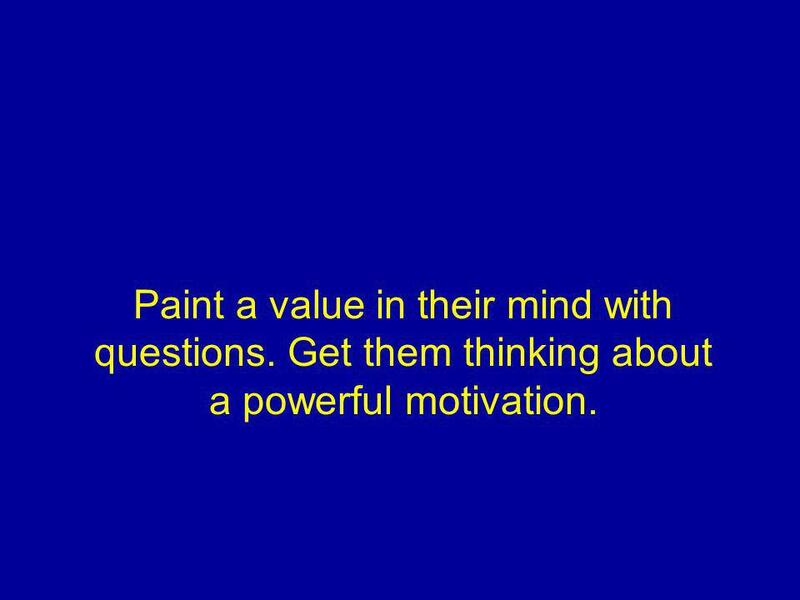 32 Paint a value in their mind with questions. Get them thinking about a powerful motivation. 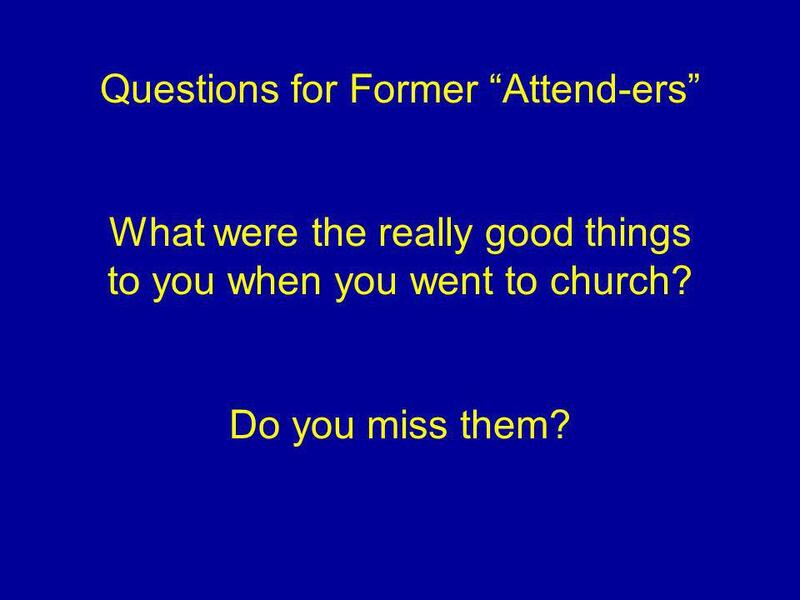 33 Questions for Former Attend-ers What were the really good things to you when you went to church? Do you miss them? 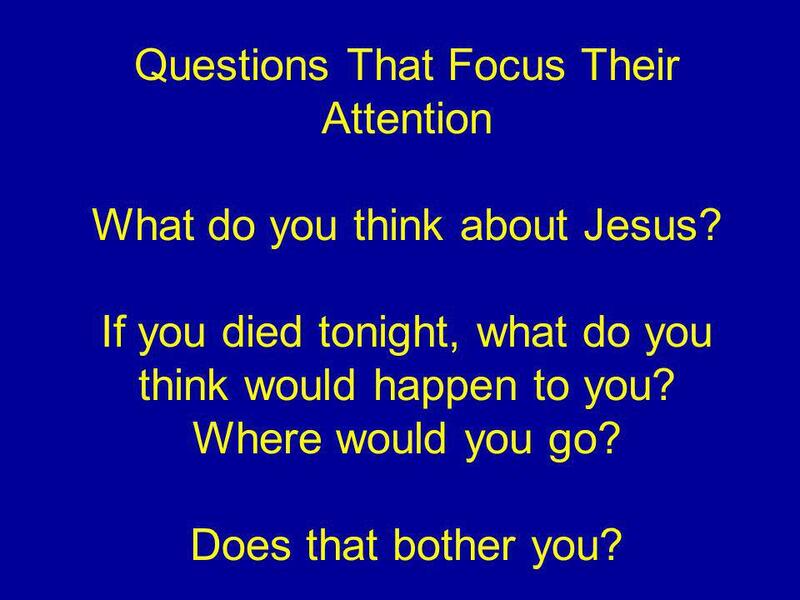 34 Questions That Focus Their Attention What do you think about Jesus? If you died tonight, what do you think would happen to you? Where would you go? Does that bother you? 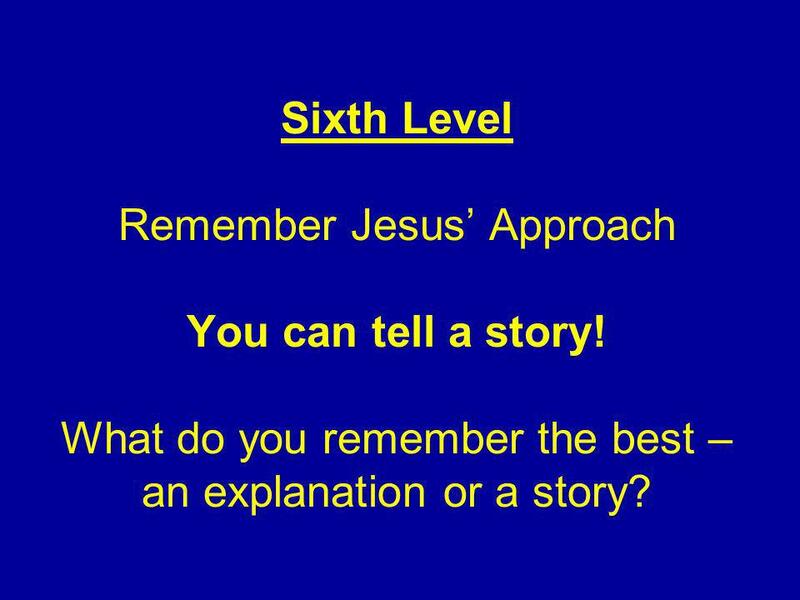 35 Sixth Level Remember Jesus Approach You can tell a story! 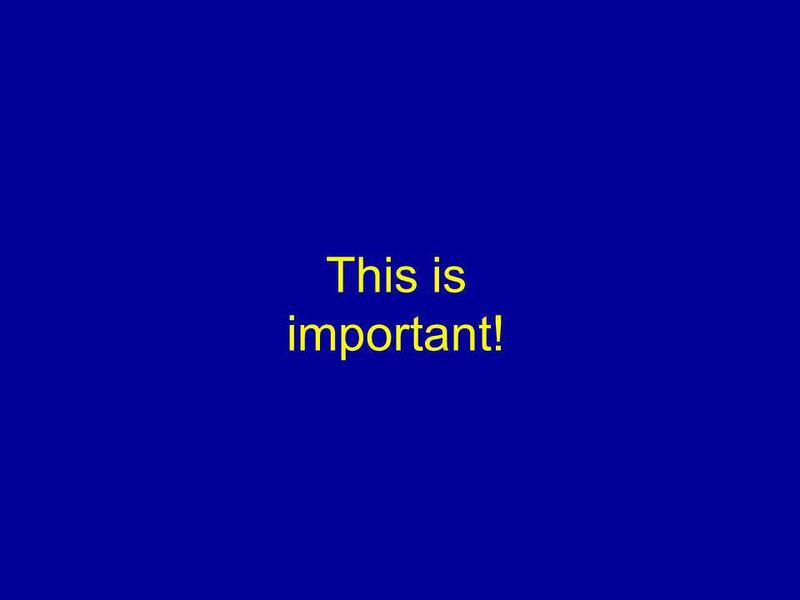 What do you remember the best – an explanation or a story? 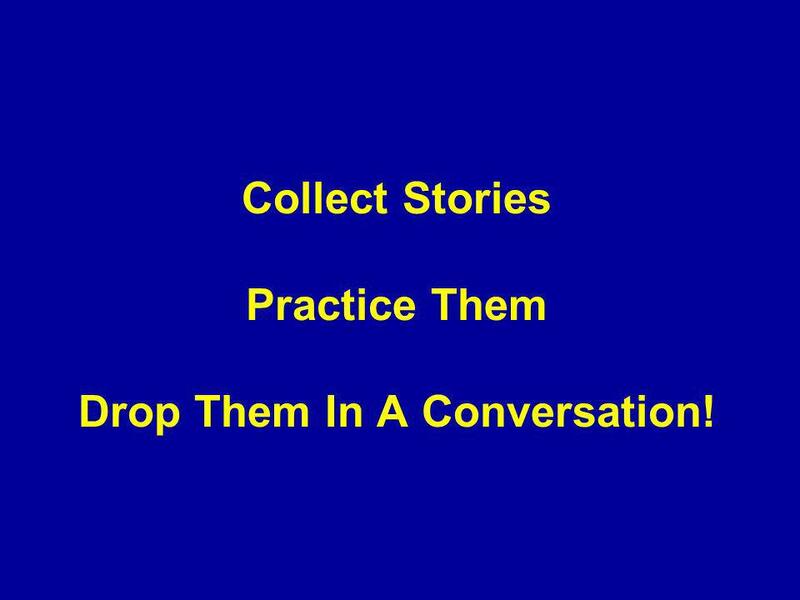 36 Collect Stories Practice Them Drop Them In A Conversation! 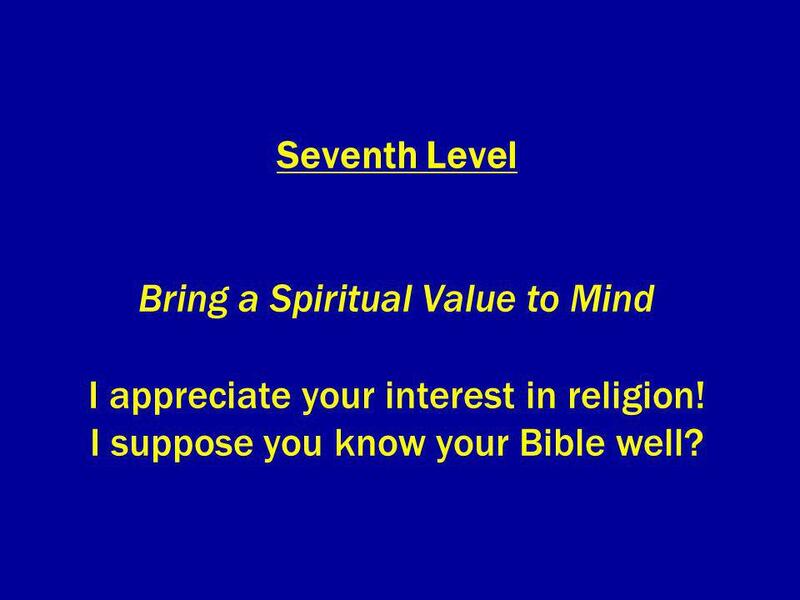 37 Seventh Level Bring a Spiritual Value to Mind I appreciate your interest in religion! I suppose you know your Bible well? 38 How well do you know your Bible on a scale of 1 to 10? Would you like to know it better? 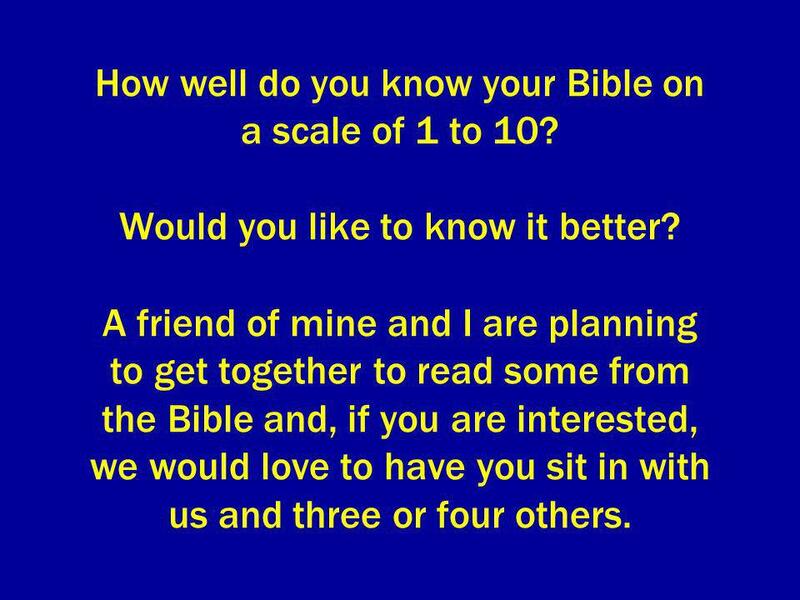 A friend of mine and I are planning to get together to read some from the Bible and, if you are interested, we would love to have you sit in with us and three or four others. 39 If your child died now, where do you think they would go for eternity? If you died now, where do you think you would be forever? 40 Occasionally, there is a place for a tough question! 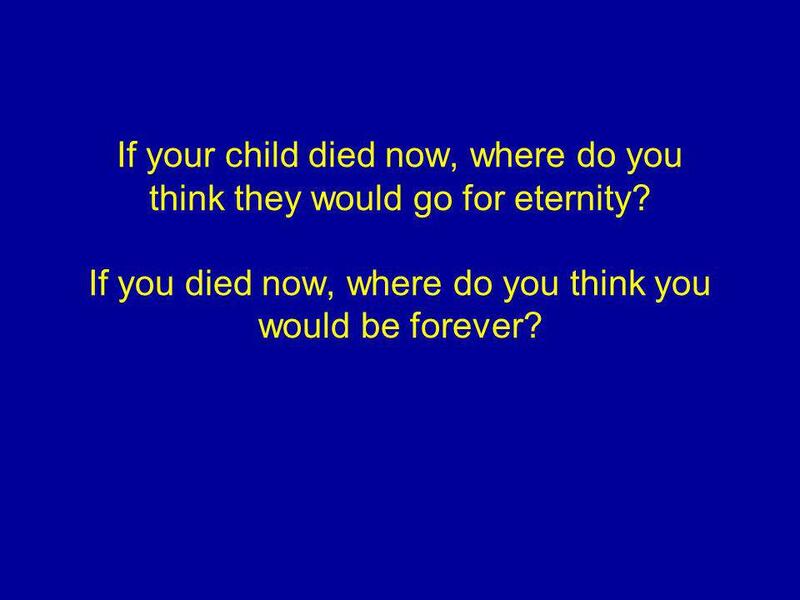 If your child died now, where do you think they would go for eternity? If you died now, where do you think you would be forever? 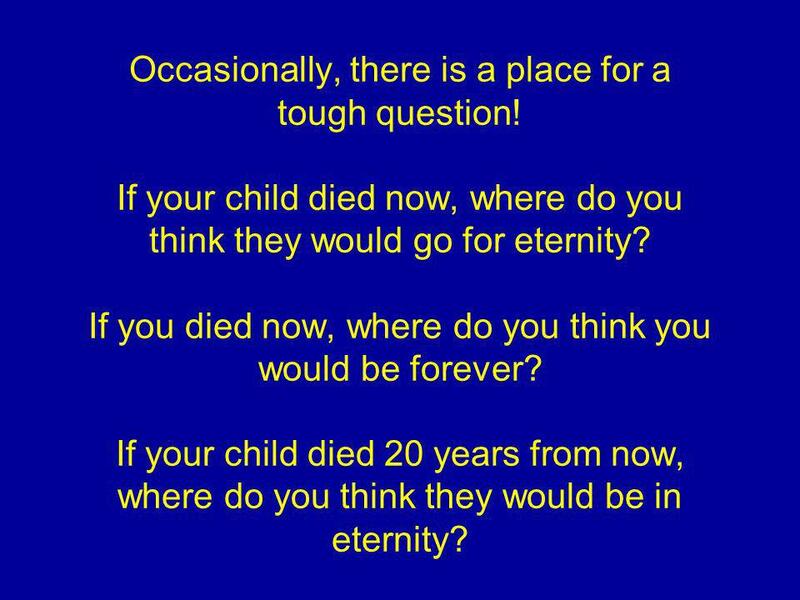 If your child died 20 years from now, where do you think they would be in eternity? 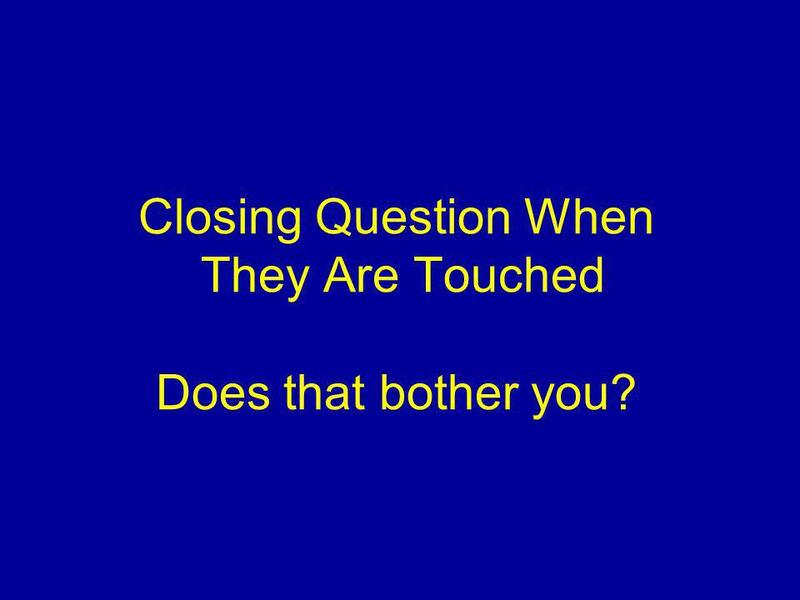 41 Closing Question When They Are Touched Does that bother you? 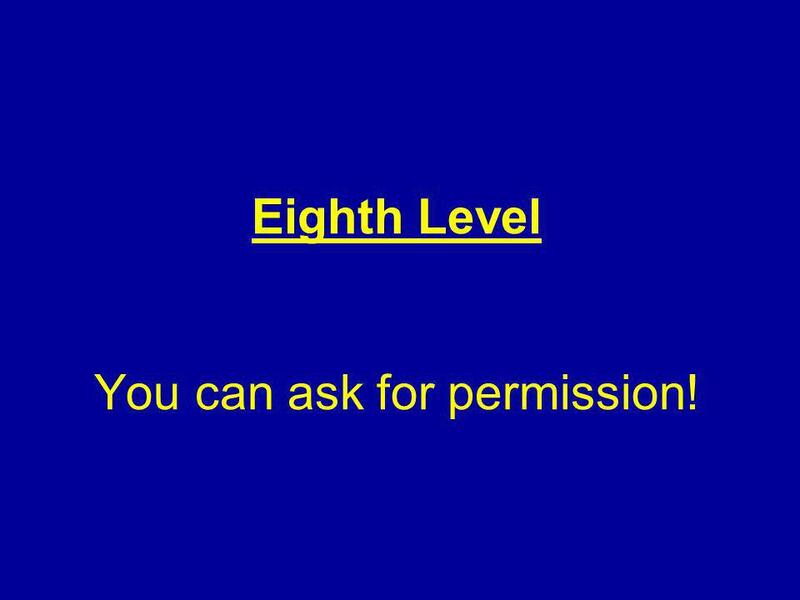 42 Eighth Level You can ask for permission! 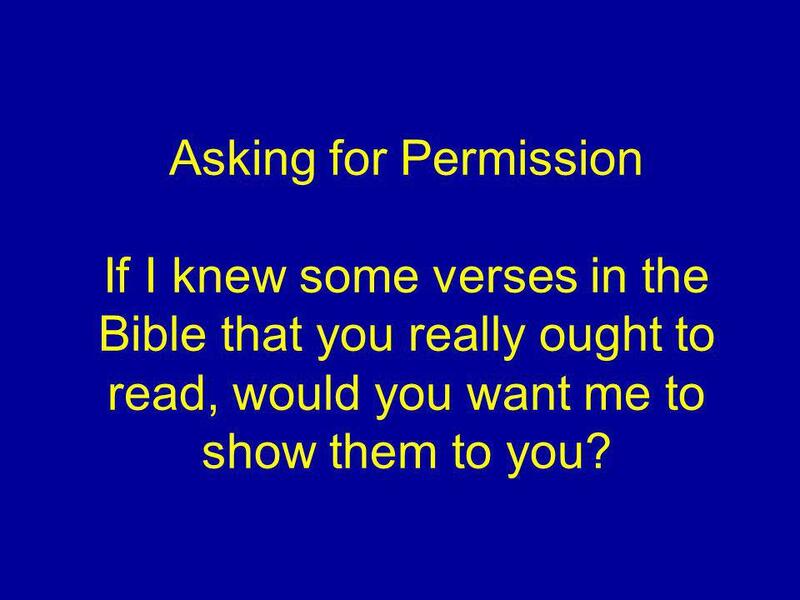 43 Asking for Permission If I knew some verses in the Bible that you really ought to read, would you want me to show them to you? 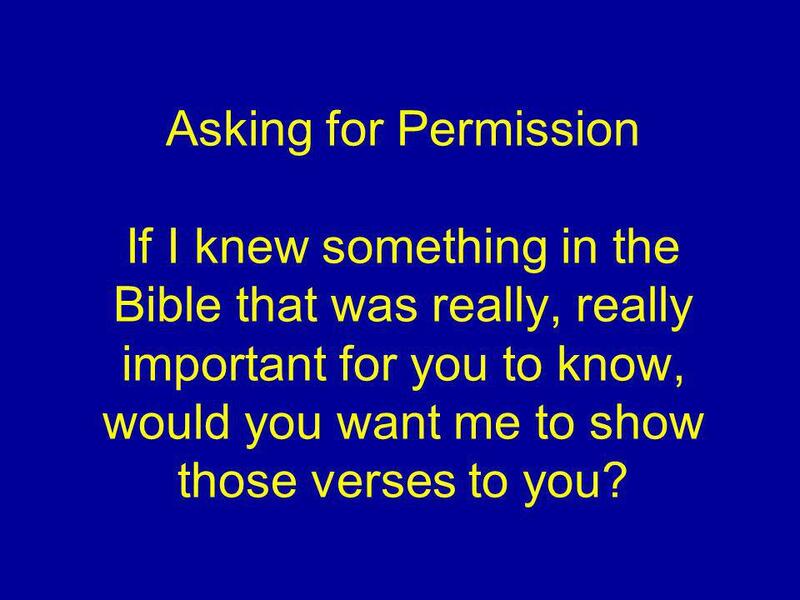 44 Asking for Permission If I knew something in the Bible that was really, really important for you to know, would you want me to show those verses to you? 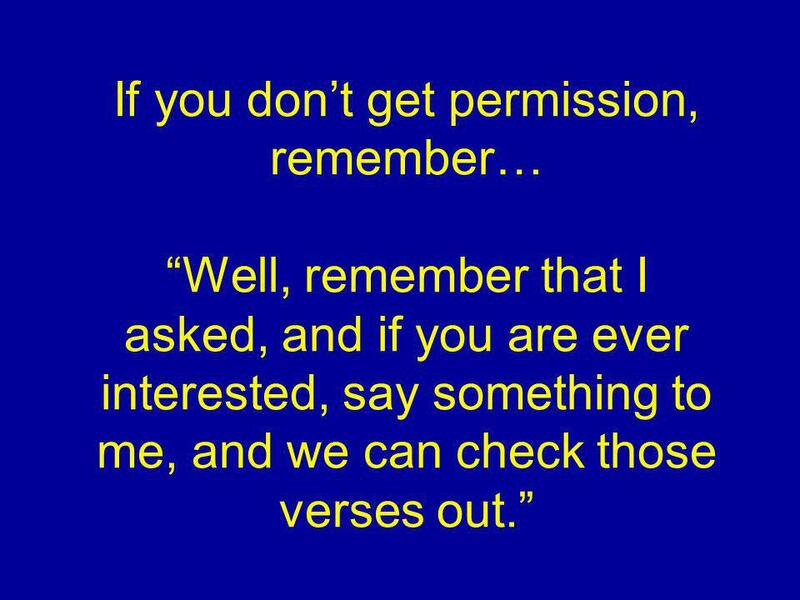 45 If you dont get permission, remember… Well, remember that I asked, and if you are ever interested, say something to me, and we can check those verses out. 46 Asking for Permission for Repeated Touches Ive told you a number of times about things at _____, and Im not trying to nag you into coming. If it bothers you and you would rather I didnt say anything about it, I wont say another word! 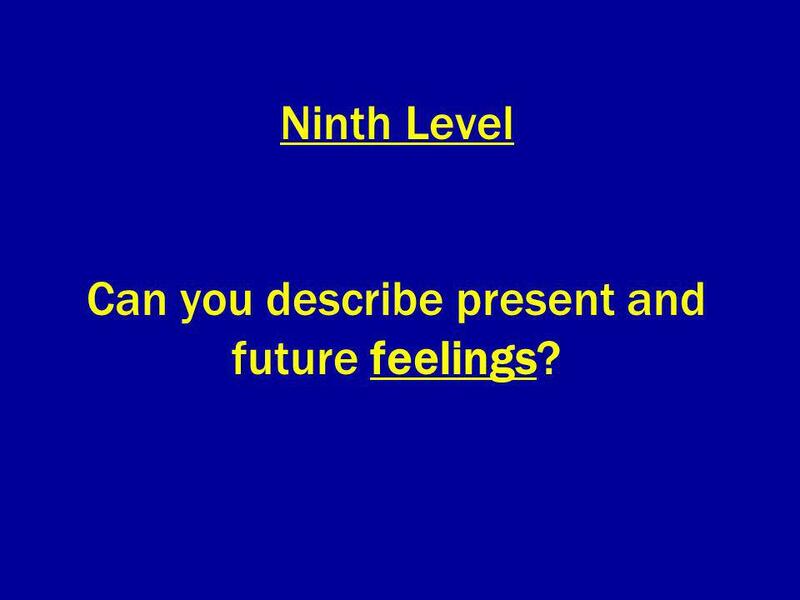 47 Ninth Level Can you describe present and future feelings? 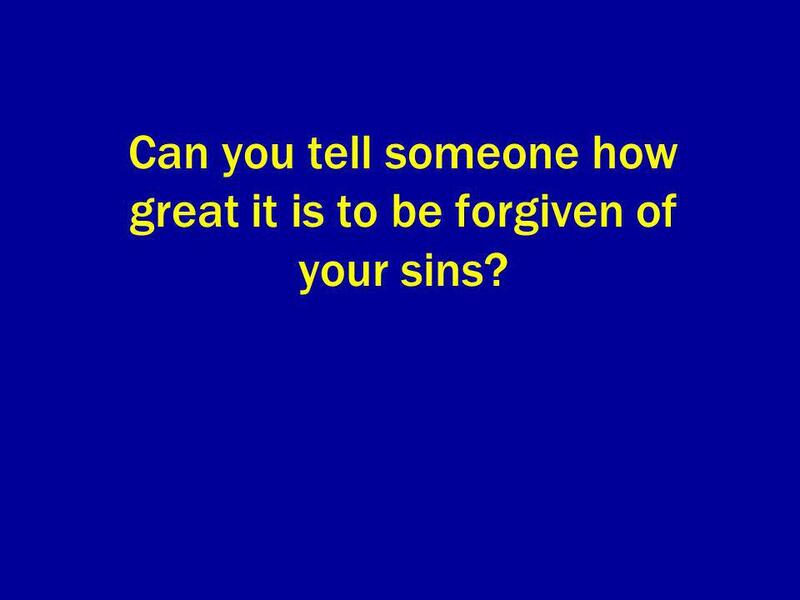 48 Can you tell someone how great it is to be forgiven of your sins? 49 Can you tell someone how exciting and humbling worship will be in heaven? 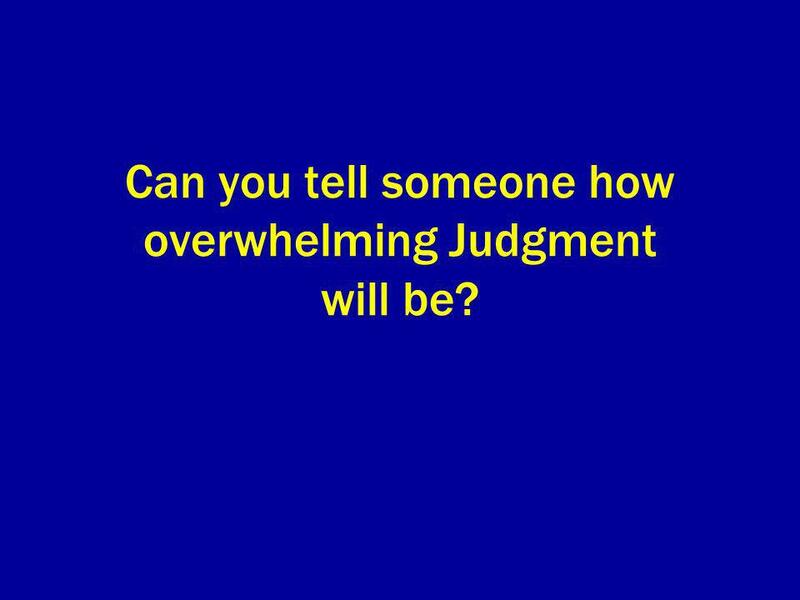 50 Can you tell someone how overwhelming Judgment will be? 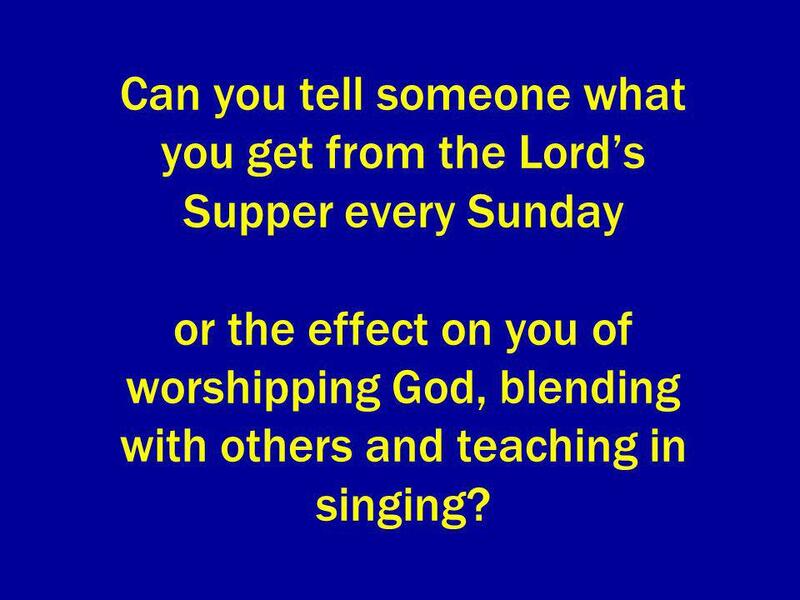 51 Can you tell someone what you get from the Lords Supper every Sunday or the effect on you of worshipping God, blending with others and teaching in singing? 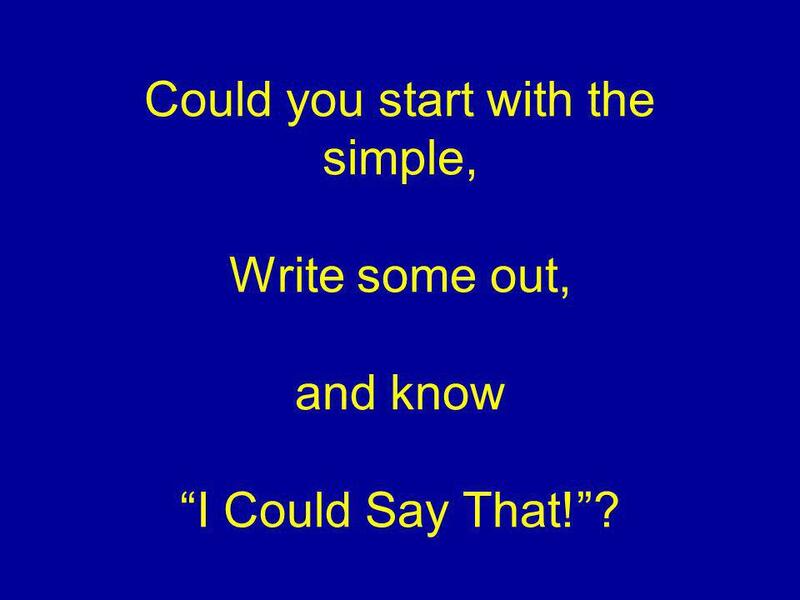 52 Could you start with the simple, Write some out, and know I Could Say That!? 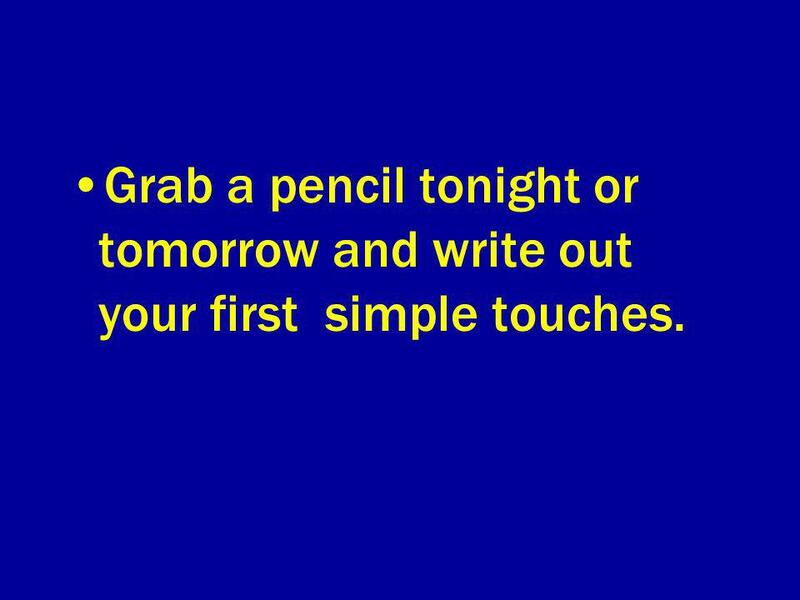 53 Grab a pencil tonight or tomorrow and write out your first simple touches. 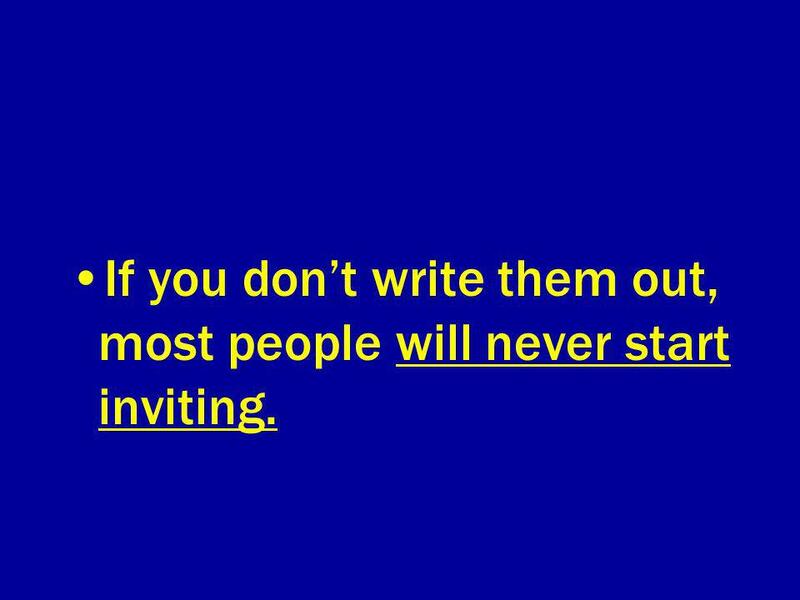 55 If you dont write them out, most people will never start inviting. 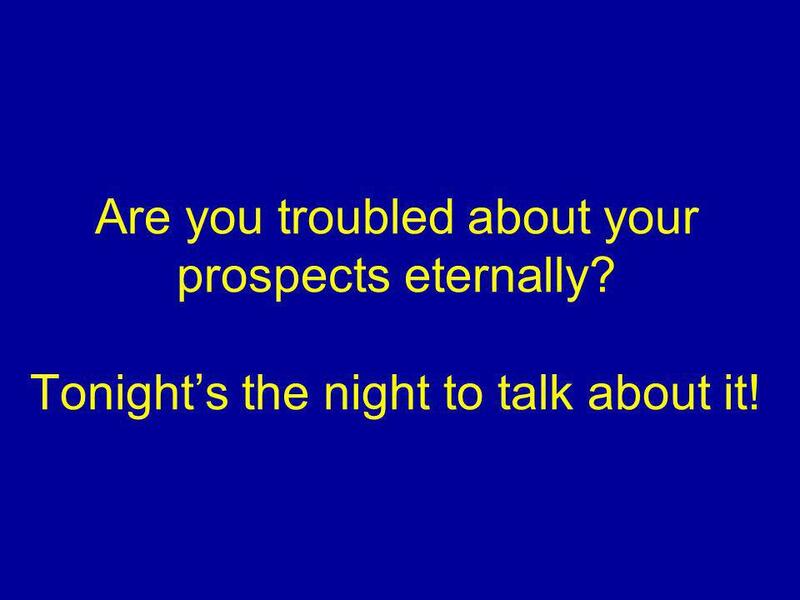 56 Are you troubled about your prospects eternally? Tonights the night to talk about it! 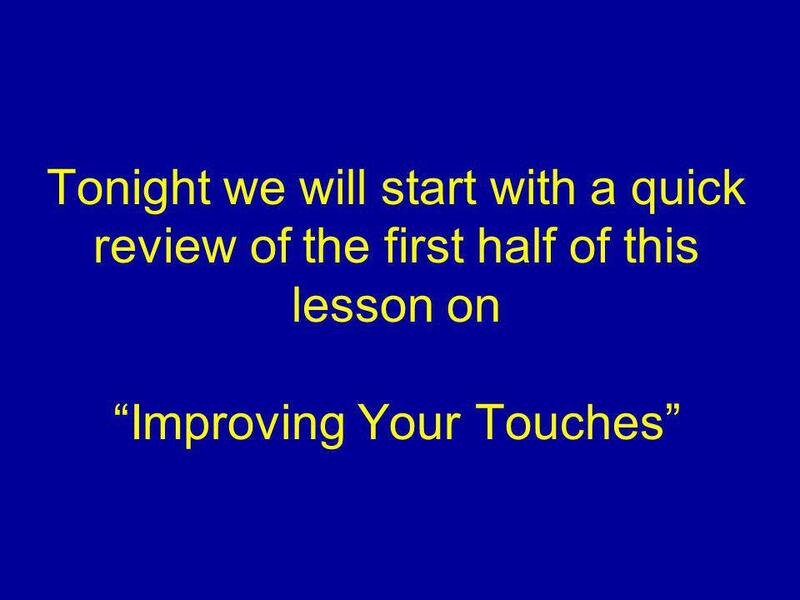 Download ppt "Tonight we will start with a quick review of the first half of this lesson on Improving Your Touches." Lesson 35. How does God want us to thank Jesus for redeeming (ransoming) us from sin, death, and the devil? Matthew 19: I. Correcting Annoyance (vs ) 1) Jesus is busy (healings and theological discussions) 2) Disciples get annoyed and rebuke the. 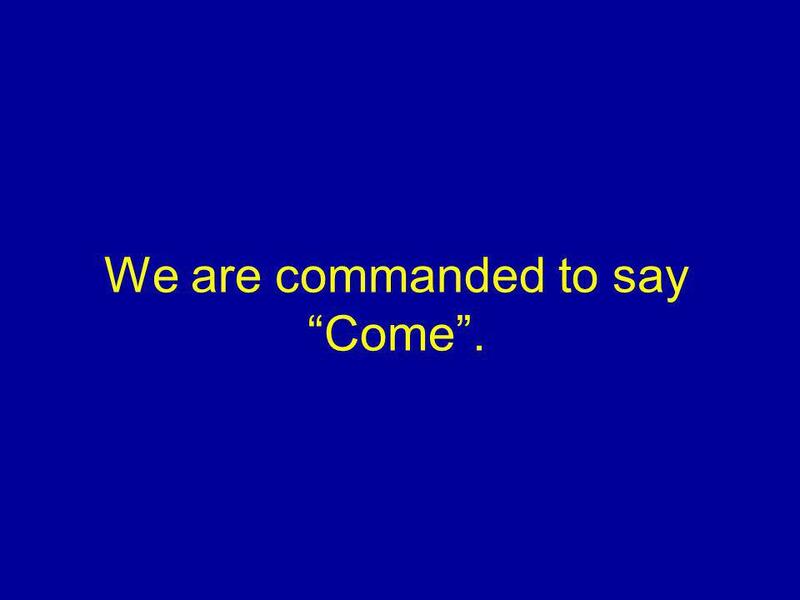 We are commanded to say Come. 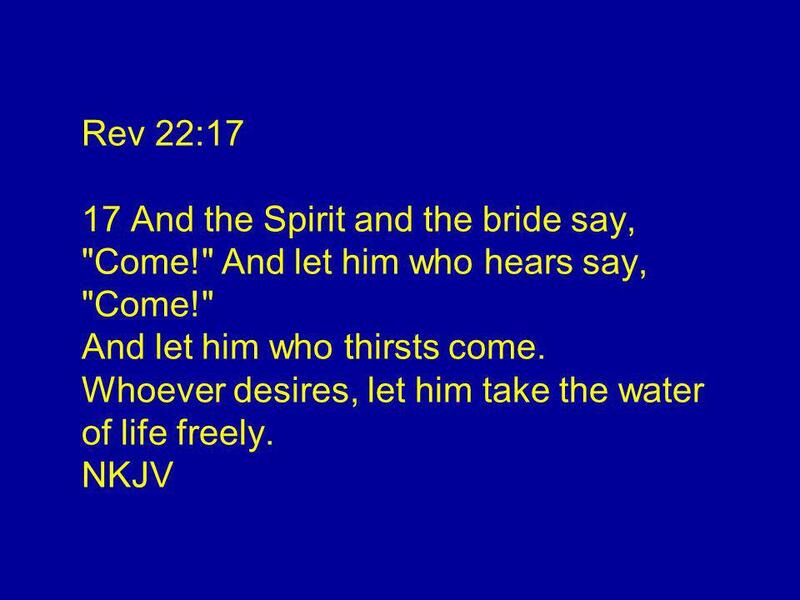 Rev 22:17 17 And the Spirit and the bride say, "Come!" And let him who hears say, "Come!" And let him who thirsts come. Take the time to sign up for Life Groups TODAY! The Bible and Love There are 4 Greek words translated into love. Walk Walk Sunday Step #201: The Promise of the Holy Spirit All scripture is taken from New King James Version (NKJV) unless otherwise indicated. All images. “Embracing Change To Experience Life!” Ecclesiastes 5:1–7. 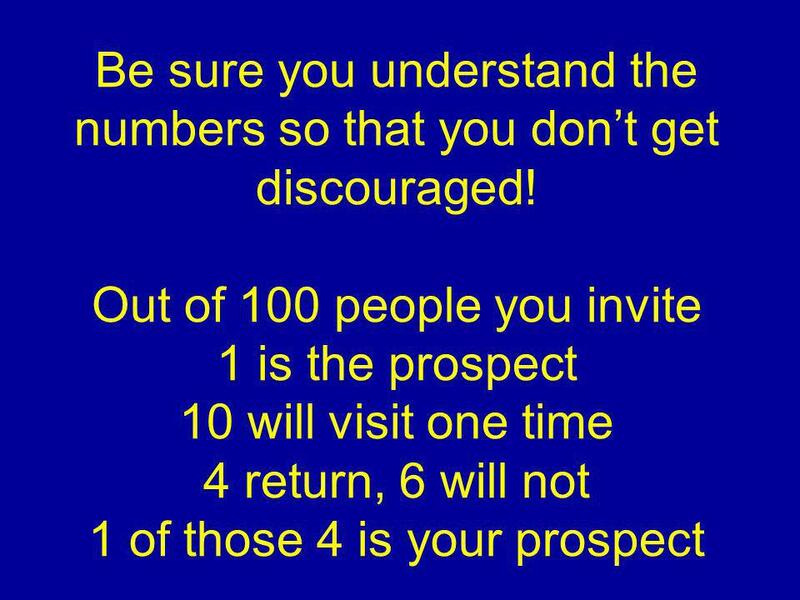 Galatians 6:7-10 (NKJV) 7 Do not be deceived, God is not mocked; for whatever a man sows, that he will also reap. 8 For he who sows to his flesh will of. Understanding The Meaning of a Text. "I am the true vine, and my Father is the gardener. He cuts off every branch in me that bears no FRUIT, while every. Developing Godly Priorities January 4. Think About It As you have grown, how have your priorities shifted? 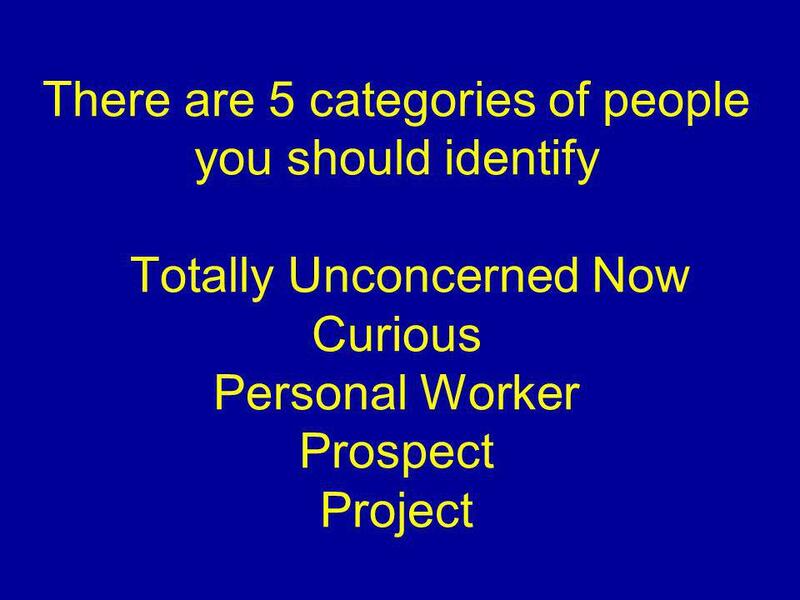 What was important at different stages of life? The Child Jesus Enters the Temple. 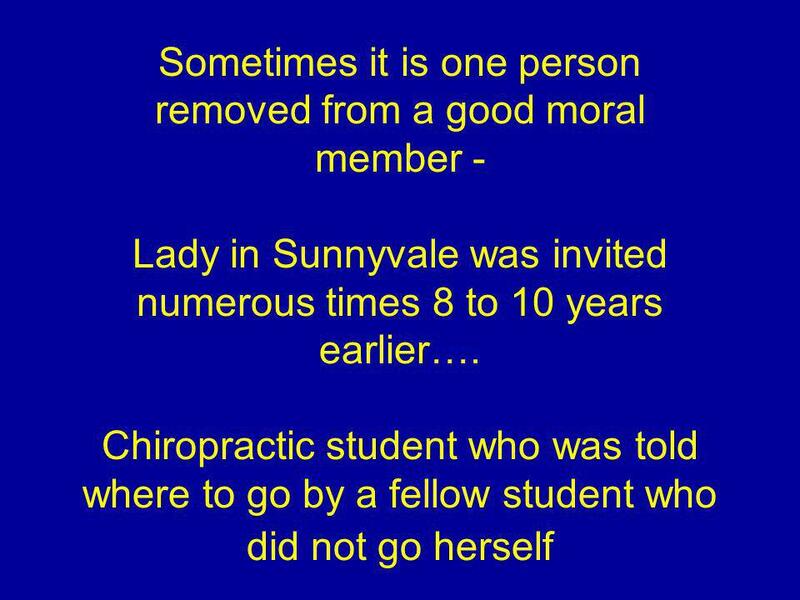 Honor Thy Mother and Father How many times do we answer our parents rudely? When they ask us to do something, do we. How to Talk to Your Kids About Christ. Deuteronomy 6:6-8 “These words that I am giving you today are to be in your heart. Repeat them to your children.